Two practices drive successful modern applications today – a fast time to market, and a relentless focus on listening to customers and rapidly iterating on their feedback. This has driven numerous improvements in software development and management practices. In this post, I will chronicle how we’ve embraced these principles to supercharge management and development experiences using SQL Server tooling. It’s easier to access popular tools, such as SQL Server Management Studio (SSMS) and SQL Server Data Tools (SSDT). Monthly releases of new SQL tools make it easy to stay current with new features and fixes. Day-to-day development is being simplified, starting with a new connection experience. New SQL Server 2016 features have a fully guided manageability experience. Automated build and deployment of SQL Server databases can improve your time to market and quality processes. We received insightful feedback from customers about how difficult it was to find and install tooling for SQL Server, so we’ve taken a few steps to ensure the experience in SQL Server 2016 is as easy as possible. The SQL Server tools download page is the unified place to find and install all SQL Server-related tools. The latest version of SQL tools doesn’t just support SQL Server 2016, but it also supports all earlier versions of SQL Server, so there is no need to install SQL tools per SQL Server version. 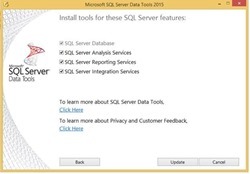 In addition, you don’t need a SQL Server license to install and use these SQL tools. SSMS has a new one-click installer that makes it easy to install, whether you’re on a server in your data center or on your laptop at home. Additionally, the installer supports administrative installs for environments not connected to the Internet. SQL Server Data Tools (SSDT) is the name for all your SQL tools installed into Visual Studio. With just one installation of SSDT in Visual Studio 2015, developers can easily integrate efforts to develop applications for SQL Server, Analysis Services, Reporting Services, Integration Services and any application in Visual Studio 2015 for SQL Server 2016 – or older versions as needed. SSDT replaces/unifies older tools such as BIDS, SSDT-BI and the database-only SSDT, eliminating the confusion about which version of Visual Studio to use. 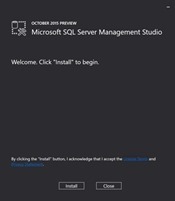 From Visual Studio 2015 and up you’ll have a simple way to install all of the SQL tools you use every day. One of the goals for SQL tools is to provide world-class support for your SQL estate wherever it may be. This could be comprised of SQL servers running on-premises or in the cloud, or some fantastic hybrid of both. We support it all. In order to enable world class coverage of this diverse estate, we have adopted a monthly release cadence for our SQL tools. This faster release cycle brings you additional value and improvements – whether it’s enabling functionality to take advantage of new Microsoft Azure cloud features, issuing a bug fix to address particularly painful errors, or even creating a new wizard/dialog to streamline management of your SQL Server. 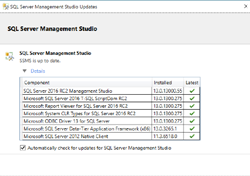 These stand-alone SSMS releases include an update checker that informs you of newer SSMS releases when they become available. SSDT update notification continues to be fully integrated with Visual Studio’s notification system. 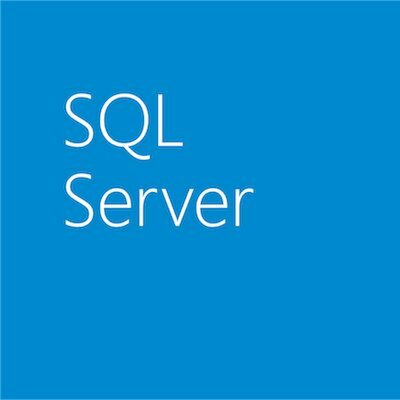 You can keep up to date and learn more about the SSMS and SSDT releases at the SQL Server Release Services blog. No more need to memorize server and database names. 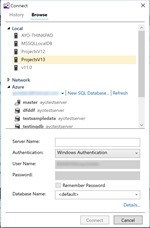 With just a few clicks, the new connection experience in SQL Server Data Tools helps you automatically discover and connect to all your database assets using favorites, recent history or by simply browsing SQL servers and databases on your local PC, network and Azure. You can also pin databases you frequently connect so they’re always there when you need them. In addition, the new connection experience intelligently detects the type of connection you need, automatically configures default properties with sensible values and guides you through firewall settings for SQL Database and Data Warehouse. The new firewall rule dialog in SSMS allows you to create an Azure database firewall rule within the context of connecting to your database. 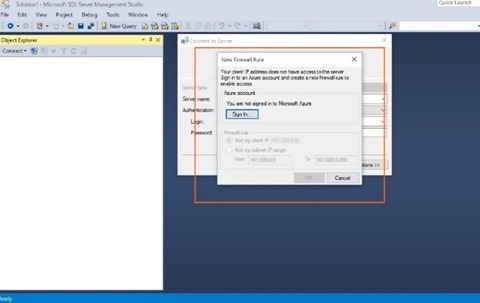 You don’t have to login to the Azure portal and create a firewall rule prior to connecting to your Azure SQL Database with SSMS. The firewall rule dialog auto-fills the IP address of your client machine and allows you to optionally whitelist an IP range to allow other connections to the database. 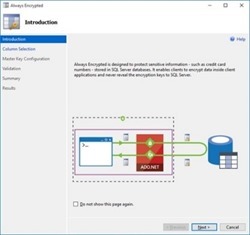 SQL Server 2016 is packed with advanced, new features including Always Encrypted, Stretch Database, enhancements with In-Memory Table Optimization and new Basic Availability Groups for AlwaysOn — just to name a few. SSMS delivers highly intelligent, easy-to-click-through wizard interfaces that help you enable these new features and make your SQL Server and Database highly secure, highly available and faster in just a few minutes. There’s an easy learning curve, even though the technology that’s under the hood enabling your business is powerful and complex. Features such as the Data-tier Application Framework (DACFx) technology and SSDT have helped make SQL Server the market leader of model-based database lifecycle management technology. DACFx and SSDT offer a comprehensive development experience by supporting all database objects in SQL Server 2016, so developers can develop a database in a declarative way using a database project. Using Visual Studio 2015, version control and Team Foundation Server 2015 or Visual Studio Team Services in the cloud, developers can automate database lifecycle management and truly adopt a DevOps model for rapid application and database development and deployment. In the months to come, you can look forward to continued enhancements in both SSMS and SSDT that focus on increasing the ease with which you develop and manage data in any SQL platform. To this end, SSMS will feature performance enhancements and streamlined management and configuration experiences that build on the new capabilities provided by the Visual Studio 2015 shell. Similarly, SSDT will deliver performance improvements and feature support to help database developers handle schema changes more efficiently. Learn more about tooling improvements for SQL Server 2016 in the video below. Improvements like these can’t happen in a vacuum. Your voice and input are absolutely essential to building the next generation of SQL tools. And the monthly release cycle for our SQL tools allows us to respond faster to the issues you bring to our attention. Please don’t forget to vote on Connect bugs or open suggestions for features you would like to see built.